Tinkoff (UCI team code: TNK) is Russia's registered professional cycling team from Russia. He participated in the UCI World Tour. In 2009 Saxo Bank became the main sponsor of the team, and later the team changed its name to Saxo Bank - Tinkoff Bank. 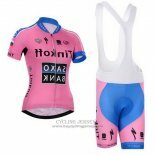 Saxo Bank cycling jerseys offers high quality, low-cost cycling suits, welcome to buy Saxo Bank cycling jerseys.